We see many patients who want to improve their smile. Their teeth might be stained, chipped, have large gaps, etc. These issues can make people self-conscious or embarrassed when they smile. But we always have great news for our patients: we can help you improve your smile, and it may not be as hard as you think! Two popular treatments we offer at Longleaf Dental: teeth whitening and porcelain veneers. This post will explore both options and then explain how they can be used together to brighten your smile. The process of teeth whitening removes stains from the enamel of your teeth. There are several different options available in the market today and each have their place. Most teeth whitening toothpastes, for instance, contain abrasives that help to remove the surface stains from your teeth. These can help maintain teeth that are already white or they can provide slight improvements over very long periods of time. For quicker, more consistent results we recommend professional teeth whitening. At Longleaf Dental, we use Zoom!® Teeth Whitening because it is fast, convenient, long lasting, safe, effective, and it creates low sensitivity for patients. This is done in our office, so you know you’ll be looked after by professional dentists who care about your smile. Best of all, the teeth whitening process usually only takes about 45 minutes. Many people will only need one appointment and few will need more than three. The number of appointments will depend on the severity of your stains and the shade of white you want for your teeth. When we provide the professional Zoom!® Teeth Whitening treatment, the results can be immediate. Some patients will get teeth that are eight shades whiter after one treatment! First, we will protect the gums around the teeth. Then, we place a whitening agent on your teeth. We then use a Zoom!® Lightspeed device that activates the whitening agent. Alternatively, we can create customized trays so you can apply the whitening agent to your teeth at home. The gel is more powerful than the over-the-counter option and the trays are much easier to use. Although this process takes more time than receiving treatment in the office, it could be the best option for some patients. Teeth whitening works best on surface stains (also called extrinsic stains). Some stains occur inside the tooth and these are called intrinsic stains. These can be caused by too much fluoride exposure as a child, tetracycline antibiotics, trauma, or other causes. For intrinsic stains, we often recommend porcelain veneers. Another very quick way to improve your smile is porcelain veneers. These are thin, but strong, shells of ceramic porcelain. They are bonded onto the front of your teeth and designed to match the look and color of your smile. 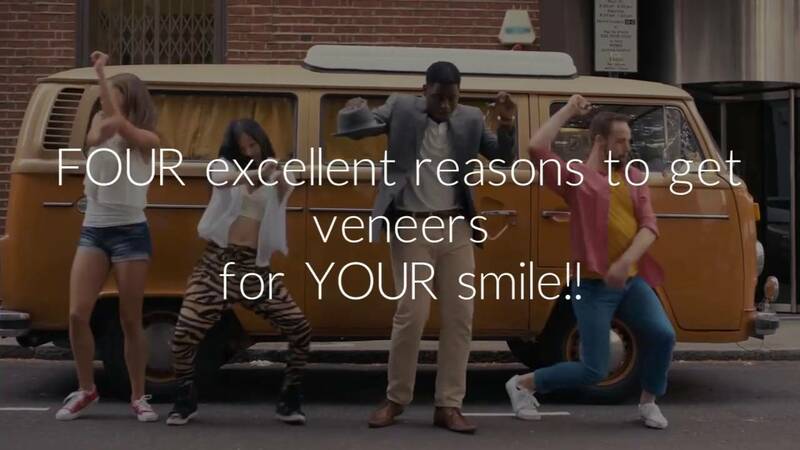 There are several reasons to choose veneers. As was stated above, your stains might be too difficult to remove with traditional teeth whitening. Veneers can cover a chip in a tooth or make a large gap in your teeth disappear. Each veneer is custom designed to fit your teeth exactly. That means when the veneer is applied, you can rest assured that it will be a perfect bonding. In order to make this bond strong, we need to remove some of the enamel from the front of your teeth. Because of this, installing veneers is a permanent change. But not to worry...this is not a decision you will regret. Veneers are very strong, just as strong as your teeth. They won’t erode or break off and should last at least twenty years. That means, when you invest in your smile with veneers, you’re making an investment that will endure. Another great benefit of veneers is that the material has more stain resistance than your teeth. That means that, with proper oral care, your smile will stay whiter for longer. Like our Zoom!® professional teeth whitening, getting veneers causes very little pain. Some patients do notice temperature sensitivity, but this only lasts for a few days. At Longleaf Dental, we take a consultative approach to dentistry. We invite our patients to discuss their concerns, wants, needs, and hopes for their smile and oral health. Because teeth whitening and veneers can’t solve every problem individually, we often provide treatment plans that include both. Need to improve some teeth stains? We can provide teeth whitening. Got a couple teeth with chips or stubborn stains? We can supplement with veneers and ensure they match the color of your freshly whitened teeth. Each person and each smile is unique. We’re passionate about meeting your specific needs, so if you’re near Albany, Georgia, then we invite you to contact us and schedule your consultation today. Our dentists will work to ensure you leave with a brighter, more confident smile that you can be proud of.